Not being one to sit idle and watch the world go by while I wait on my shiny new electric to be delivered. I have spent the last few days cruising the forum trying to quench my thirst for anything and everything, violin! I must say the information exchanged here is amazing! I'm so glad I found such a place where the members freely exchange knowledge and information so well. This is an incredible benefit to someone so new to the violin, like myself. I stumbled across a thread about violins in white and discovered a wealth of interesting facts. For instance, I had no idea that 80% of the world's violins are made in China! I never imagined that China would be supplying high quality anything to the world, no less violins!! lol! So naturally questions started floating to the top. Well, there's a few of us on here that have finished out the "in the white" violin. I had one given as a gift by another member here at Christmas a couple of years ago. (Thank you Toni) and it is not the traditional redish color as I decided to shellac the wood to a natural "blond" color. It sure gets a lot of attention when I drag it out! Pierre. Mr Fiddlerman himself. Many of the highest quality violins you can get come thru his hands and if you buy one from him thru his http://www.fiddlershop.com site you can be sure of getting a quality piece. If you don't like it send it back, he is the best! I've enclosed a few pics of mine as it got completed. It sounds incredible and I expect it will continue to improve with age. This summer I will complete the finish as I think it has had plenty of time to soak into the wood and cure completely. Thanks for the reply! That is a beautiful piece you have, thanks for sharing! I would like to do something similar with the blonde finish, possibly flamed or birdseye. I have the wood finishing skills to get the look I want, my weakness is the fiddle finishing, so I have a lot to learn! Amazon has some fiddles in the white starting at about $60 delivered, if you want to see what it's like. I personally met two award winning Chinese luthiers - Scott Cao (do not pronounced as cow, but chao without the h sound) and Jun Wu a couple years ago. I bought several kits from a Chinese dealer and had finished making the 1/2 size one 18 months ago. I varnished it with clear oil varnish, it turns out great - kind of yellowish. It has a great sound and tone. 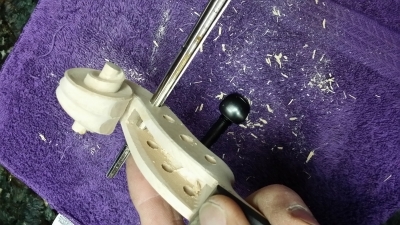 I am currently working on the 3/4 size kit - it requires a little more work - I need to clean the channel and inlay the purlings. I want to make it a purple violin but haven't found any purple varnish... I may just keep it clear. I hope it will sound great as well. I bought a 4/4 bird eye kit as well, haven't done a thing on it, I want to use clear finish on it as well but don't know if it will turn out okay since there are repaired holes (white patty) on it. I also bought wood for 4/4 violin, but considering making a 7/8 size instead. I really want to give this a try. 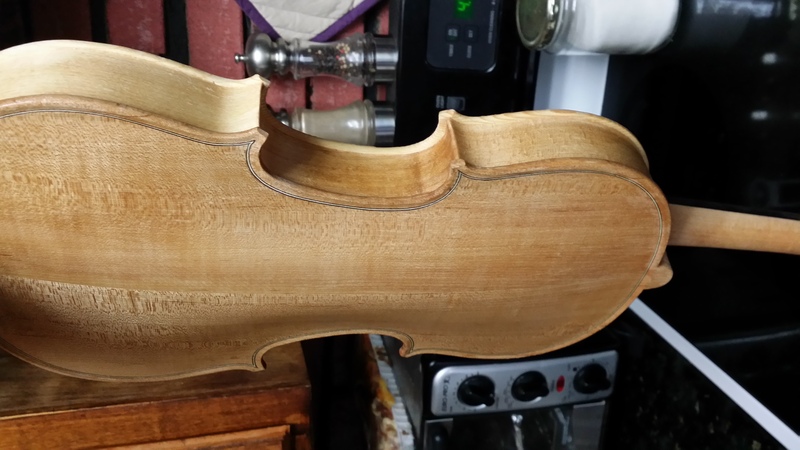 I do have considerable wood working and wood finishing experience, my lack of knowledge for the violin is my only concern, but I am patient and willing to learn. Although I have seen some in the white violins that already have the parts assembled but are not varnished. Tho having limited to zero knowledge as of now, I'm not sure if these need additional work or if they are complete and ready for the finish. you probably have to sand it till it's smooth enough. One member mentioned in the past, these kits might have flaws. you will have to decide to use oil or spirit varnish. I prefer oil. There are other members here who are a lot more experienced than I am so consider their suggestions and opinions. Thanks again for your input! I'm going to give this a shot! With my schedule, being on the road for 6-8 weeks at a time, this is going to be a long process. Which should give me the time I need to learn more about the violin and its construction. Now I just need to find the right piece! Thanks Dennis, that is very kind of you to say. junglejim, the violins that you can get for $60 as Uzi suggested are going to be made from pretty low quality wood but they would give you a great practice instrument for your intent. The sound may or may not be acceptable when you finish but it's better to practice working on a cheap instrument than an expensive one. Obviously price has a lot to do with quality but not always. Sometimes distributors are making well over 100% profit on each instrument while others will settle for less than 50%. The same thing goes for retail dealers though with some products the profit margins are as low as 10%. Thanks for all the input! I've never been one to go "cheap" although jumping into something with both feet, that I have basicly no knowledge of, cheap would make sense. But then again I've never been accused of having much of that either, lol! I've actually been looking at some unfinished fiddles in the $200-$300 range, that have nicer flamed backs and just from what I can see in the pics posted with those listings, appear to be better quality. Then again with little knowledge, its a crap shoot! Fiddlerman, is it possible for you to get them in white? Or possibly point me in the right direction of a quality piece at around $300? @junglejim: Here's a violin kit you may consider. My boss bought me this kit for, Christmas this past. Although do to health issue's I haven't started on it yet, but plan to in the very near future. 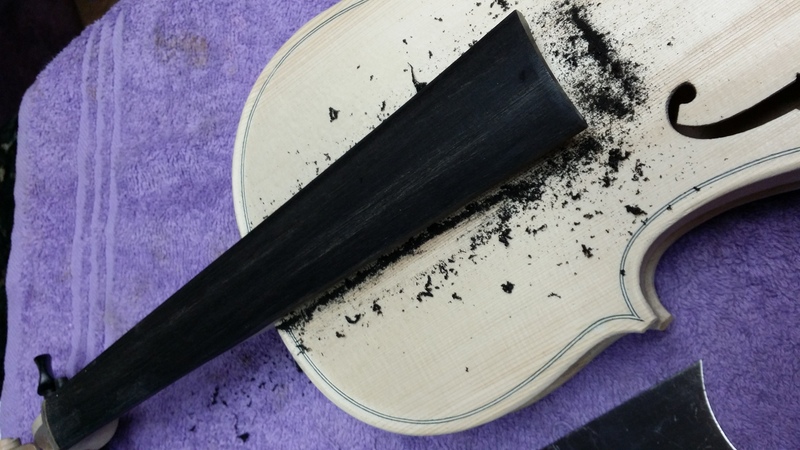 There's quite a bit of work to do, as the top and bottom need to be graduated, purfling's cut in, attaching the neck and finger board and scooping the finger board. Comes with a really nice case too. Here are two photo's of my kit. Yes that's correct 80% of the worlds Violins are manufactured in China, they dominate the market. Alot of it's the super low priced stuff that's still not great but it's that top 5% that's being built ( according to my research ) that's BLOWING away the competition everywhere else in quality and price. These are the astonishing quality ones that are being produced. Chinas come a LONG way in the past several years in their Violin building reputation. They are keeping rpoduction numbers high, and prices SUPER low, while sending the quality right through the roof. It's nothing short of a Violin marketing marvel to be honest how they've been able to do it. I've read in the student and intermediate category they absolutely destroy the competition on virtually every point. They're being built not only by trained luthiers who've studied in Italy but also in small shops with small to mid sized teams of Chinese handcraftsmen who build them "to the numbers" with excellent precision and speed, including quality wood. I'm hearing some of the best small shops and factories building the best Chinese stuff are located in the Beijing area and that ALOT of known European brands and builders are going there to do business and having Violin lines made for their brands, especially entry level and intermediate level Violins. These Violins after a decent set-up are some of the best bang for the buck out there on the market today especially from about $400 on up to around $1500 to $2000. Brands like GVC, Scott Cao, Eastman, Yita, not excluding if you do the reasearch MANY other brands that are carrying these Violins from these shops. Alot of the brands that have the "german" or "italian" sounding names are actually Chinese built. Regarding Violins in the white, Ive seen some nice ones on Ebay and also Gliga will make Violins in the white for purchase as well I believe. EBay is where I have been looking mostly... I am seeing some beautiful flamed and birdseye maple with price points at or below $300. Looks like all the work is already done for you, I thought you wanted were looking for a kit to build. If it's already together together you have no control on the thickness of the top and bottom plates. We can and have gotten the white violins but it's not our specialty. We've never purchased the cheapest stuff so I'm not sure what you get for under $100. I recommend you go with the guys who have a lot of white violins and try to get at least some pictures before making a choice. Like Fiddlerstix said, the only thing you need to do for this violin is to varnish it and maybe made a new bridge and put a set of nice strings on it. Below is probably the cheapest you could find. A member (check the six-foot violin thread under CatMcCall) here has worked on a couple of them and they sound decent, and you get a lot of practice from this one. The kit that I got is similar to this one but in fractional size - first one first one already has purfling on, but the rest of them do not. Choice of strings may make a big difference in sound. 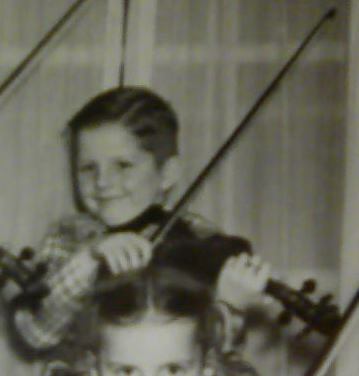 My violin teacher gave me a lower end 1/2 size violin to work on - I replaced the nut and finger board, the bridge, and put a set of used dominant strings on it, and it sounds great, but there's still some differences in other aspects - projection, loudness under ear and in audience, etc. The ad says it was handmade by his little brother "Roy", hmmm. is that a Chinese name? They seem to sell a lot of verious "unfinished" musical things, guitar necks, bodies, and violins too. Seems worth taking a chance on but I'm thinking for that money I'd want it in pieces so I could graduate the body like previously mentioned above. Nice looking violin but the sound is what we want to be the most beautiful though. $200 seems a little high but add $50 for shipping and you could have a really nice entry level violin ready to play. In Chinese "Little brother" could mean real brother or a friend. pky is correct, there are no translations from Chinese to English, so they pick an English name. For example, my online friend in China, her name is "xiao..... I can't even spell it, but she took the English name of Emma to make it easier for other's to remember and pronounce.